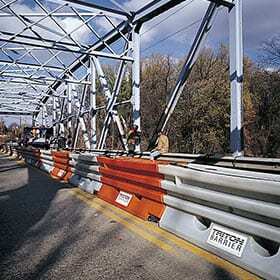 The Triton Barrier® is a steel-reinforced, water-filled portable barrier made of polyethylene plastic. It consists of interlocking 6.5 foot (2 m) barrier sections made of polyethylene plastic with an internal steel framework. 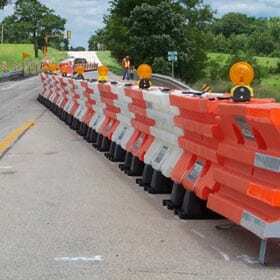 This crashworthy work zone barrier shields crews and prevents vehicle penetration into the work area. Triton Barrier serves as its own crashworthy end terminal. Just place the sections in position, pin together and fill with water. Models are available that meet NCHRP 350 Test Level 2 and Test Level 3.